At the season opener of the ADAC GT Masters in Oschersleben Norbert Siedler celebrated his racing-debut with the Lamborghini Huracán GT3. In spite of problems in the qualifyings, Norbert Siedler and his team-mate Jaap van Lagen (Netherlands) only narrowly missed a point-result on Sunday and finished in eleventh position. 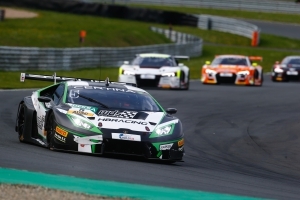 Position 20 in the qualifying for Saturday’s race was not the best start into the first of seven race weekends of the ADAC GT Masters for Norbert Siedler and the HB Racing Team. „Especially with new tyres we have some potential to improve,“ the 33-year-old analysed afterwards. “As a new team we need some more experience with the car. 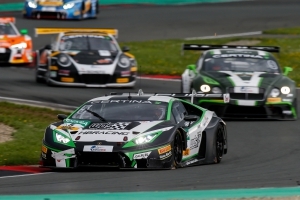 In this close series details in the car setup can cost you many positions.” In the first race in Oschersleben the Lamborghini duo finished in 19th position. But there was not much time to gain positions for start driver Jaap van Lagen and Norbert Siedler on Sunday: A red flag and several safety-car-periods caused interruptions again and again. When the race was green-flagged for a final sprint two minutes before the end, Norbert Siedler did his best to overtake the Audi from Car-Collection-Motorsport in front of him. But the chequered flag came too early. After 34 laps the HB Racing driver crossed the finish line in eleventh position and thereby missed a point-result only narrowly. Already in two weeks the next races of the ADAC GT Masters will be held at Sachsenring. 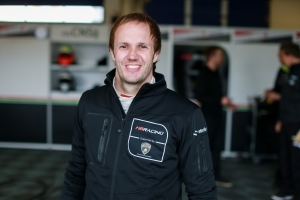 But at the next weekend Norbert Siedler will be racing in Italy: At the Blancpain Endurance Cup’s season opener in Monza the Tyrolean will share a Ferrari 458 of Rinaldi Racing with his team-mates Marco Seefried and Rinat Salikhov.